As a coffee fanatic, what’s your biggest nightmare? Mine has to be the day where I wake up all groggy, eyes bleary, without a brewer, dripper or machine to make my morning cup of coffee. Heavens forbid, I’d have to turn to instant coffee. Come to think of it, to be stuck without a coffee machine doesn’t really have to leave you high and dry…. Don’t worry I’m not going to tell you to drink instant coffee – we’d prefer to leave that s**t to nightmares (seriously, instant coffee might negatively affect your health!). Brace yourself - I’m about to open your eyes to a few simple ways (5 in fact) on how to make coffee without a coffee maker. Use freshly ground coffee - this is an obvious one, however, i'll say it again since it will make a huge difference. Always use freshly ground beans. You have about 15-20 minutes before your beans start losing some of that goodness that makes them taste the way they do. Use Freshly Roasted Coffee - a half decent cup of coffee always starts with the beans - you'll want decent beans that have been roasted within the last 2 weeks. This point alone make a huge difference. The Right Water Temperature - Too hot (boiling water) and you'll scold your beans, too cold and you'll under extract them. The Cowboy Method brings you back to the old-fashioned ways of good coffee brewing - your best beans and nearly boiling (or just boiled) water. We'll show you how to do it from your home - you don't actually have to be around a campfire or be wearing a cowboy hat to make it. It's simply a matter of making do with what you've got - a pot, a heat source, ground coffee and some water. It's perfect if you don't have a coffee machine, and just like a french press it brews an excellent cup of joe. But of course it's important to remember that the quality of coffee is essential. Step 1 - Fill a clean pan with a bit more water than what you normally use when you brew your coffee. For example, if you use two cups of water, add about 3/4 of a cup extra this time. Step 2 - Place the pan on your stove and turn on the heat. When the water comes to a boil, add your coffee. A conservative ratio is about two tablespoons for every 6 ounces of water, but you can adjust that depending on how strong you want your coffee. Step 3 - Remove the pan from heat and cover it immediately. Wait about four to five minutes before you uncover the pan. Once you see that all grounds have settled to the bottom of pan, you’re ready to serve your coffee. Once you see that all grounds have settled to the bottom of pan, you’re ready to serve your coffee. Step 4 - No fancy kettles needed here - you can just pour off the top onto your cup. You can also opt to use a ladle for more ‘filtered’ servings. If you're going camping in the near future, here'﻿s another list that will show you how to brew coffee when you're in the great outdoors. No Hario, no Chemex, no Kone, and no Kalita Wave - they are all great manual pour over brewers, but how the hell do you create pour-over without one? Try the makeshift coffee filter, which lets you make use of this brewing method using materials you most likely already have in your kitchen. Ultimately though, a handkerchief is best for this method as it is both easily available and durable enough to withstand the temperature and pressure of water being poured over. No filter? Try a hanky or cheesecloth, but make sure you wash it out first! Step 1 - First, prepare your filter. Get your clean handkerchief (or alternative filter) and fold it into a square that will fit the mouth of your mug or cup. Make sure to leave a margin of cloth, around two inches, that should hang over the sides of your cup. Step 2 - Clamp the handkerchief securely to the sides of your cup. Check the tightness of the clips to ensure the cloth stays in place while you’re pouring hot water. Step 3 - What you’re aiming for next is getting a medium-coarse, almost sand-like grind. It is best to use a good quality burr grinder that gives you consistent results. Step 4 - Depending on the grinder you’re using, grind until you reach the first marking or first cup symbol. Step 5 - Once you have enough coffee to reach the target measure, place the ground coffee onto your filter set-up. Give it a little shake to spread the grounds equally on the filter. Step 6 - Boil two cups of water and once it reaches boiling point, take it off the heat source. Let the water cool off for thirty seconds. You can then pour a bit of the water on the grounds, just enough to wet the coffee. Let it bloom for about thirty seconds before doing another slow pour, this time half of the remaining water for another thirty seconds. During the first pour you’ll most likely see a thin foam start to form on top of your grounds. This is called ‘blooming’, a process common to pour-over methods, and shows your coffee is fresh and is releasing CO2 gases. Do four slow pours after until you have used up all the remaining water. If you're using a thick makeshift filter, you may need to tease the grounds a little to help the drip flow using a spoon. Step 7 - Once this two-minute process is complete, all the coffee grounds should be fully saturated. When all the water has seeped through the handkerchief, you can carefully remove the clips and your makeshift filter. And you've done it - if you followed the above steps + the 3 rules at the beginning of the article, you should have a nice DIY brew! This method makes use of your favorite coffee bag - it’s similar to a tea bag, but with coffee grounds inside. Its one of the simplest and quickest ways to make coffee without a machine. Any coffee bag, along with hot water and your go-to mug, is all that you need. Step 1 - You can heat water using a kettle, pan, or pot - or you can simply put your cup in the microwave. Get your water to boiling, and then immediately turn the heat off. Let the boiled water cool for about 30 seconds. Step 2 - Place your coffee bag in a clean cup and do a slow pour of the water into it. Make sure to get your grounds-filled coffee bag saturated with the hot water, up to your desired level. Step 3 - Let the coffee bag stay immersed in the hot water for around 4 minutes. You can adjust the the strength of your brew by managing the steeping time. 2-3 minutes will give you a weaker cup, and 5 to 6 minutes will yield a stronger cup. Step 4 - Once you’ve reached your desired steep time, carefully remove the coffee bag, and discard it. Brutal? Maybe. But it's quick, easy and does not require anything that even resembles a coffee maker. This method is very similar to the one above (The Coffee Bag) regarding the brewing process, only this time it has a bit of a DIY twist. What do you do when you realize you have no coffee bags left? No, you don't cry or drink instant coffee...just make a damn coffee bag yourself! 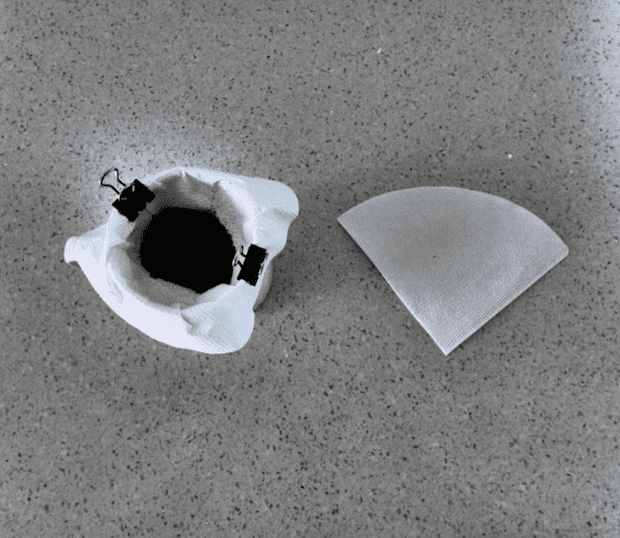 If you have any type of coffee filter lying around (and some coffee, of course) you easily can make a decent coffee. You can even use a tea bag and carefully replace the tea with coffee grinds. I prefer this method to the store-bought coffee bag since you have the option to freshly ground your beans. Its simple really: you're making a tea bag and replacing the tea with medium-course coffee grounds. Step 1 - Get your clean water to a boil using any available heating source. Once it boils, remove from heat immediately. Step 2 - Scoop out the amount of grounds you use for your usual cup of coffee. Around two tablespoons for every 250 ml of water is a good estimate. Place the grounds in the middle of your coffee filter, and make your own ‘coffee bag’ by tying the top tightly with a length of string. Leave a bit of free string long enough for you to easily pull the bag out of the cup later. Step 3 - Place your coffee bag into the cup, and pour the hot water directly over it. Fill the cup to your desired level, and make sure to completely submerge the bag to ensure equal extraction of your grounds. Step 4 - Keep your coffee bag in the cup and let it steep for about 3-4 minutes. You can shorten it to 2-3 minutes if you want a weaker brew, and make it 4-5 minutes if you want something stronger. Step 5 - When the steeping time is up, simply tug on the string to remove your coffee bag, and enjoy your brew. Pro Tip: Give the coffee bag a bit of squeeze with the back of a spoon before pulling it out. This will get the remaining coffee juices out of the grounds into your brew, making it a stronger blend. This one's handy for those times when your French press is not readily available, but you still want to enjoy the rich, oily and flavorful brew a damn good french press offers. It's similar to the cowboy method, just with a little more finesse required. We'll mimic the French press process using readily available kitchen items such as mugs and hot water. It will be almost as good as a french press, but not quite. Step 2 - Throw your grounds in a clean, empty cup. Pour in enough hot water (ideally cooled down for thirty seconds after boiling) to cover the grounds - you're just trying to wet them. Wait for about thirty seconds before doing the next pour. Step 4 - Start your timers and let the coffee brew for about four minutes. Pro Tip: If you want a stronger cup, extend this to another minute, if you want a less aggressive brew, deduct one minute. Step 5 - Once time is up, slowly and carefully transfer your coffee to the cup you will be drinking from. This requires finesse, but should be so hard with a steady hand. Your wet ground will have sunk (mostly) to the bottom of the steeping cup, so don't pour in the last 30 or so millilitres. Look – I’m not saying you have to start brewing coffee with a pot and pan, however isn’t it great having the peace of mind? One of the above tricks just may come in handy during those times on the road, traveling somewhere, or camping with your buddies. Even if you’re not into outdoor adventures you’ll never really know when your coffee machine may decide to kick the bucket - and a saucepan, hot water, and your trusty coffee grounds may be all you have in left. It's times like these you'll be thankful that HomeGrounds taught you what to do. And that’s how to brew coffee without a coffee maker. What do you think about these methods? Do you have any of your own you want to share? Feel free to mention them in the comments. If you liked this article, share it and help your fellow caffeine addicts in there quest to brew awesome coffee. Good point! I Do love me some Bali kopi (thats what i’ve always called it) but I don’t love those moments when you get a mouthful of coffee near the end of your cup! I don’t think any of these methods leave me with a hot cup of coffee. Between the 30 sec wait and the another 4 minutes of steeping or whatever the coffee would be not be hot after 5 minutes. They all leave me with a hot cup of coffee! You should try pre-heating you cup in that case, it makes a huge difference. Placing a Globe on countertop is essential, when you brew a good cup of coffee. Try that and you’ll taste the difference. Pro tip: For best results, you should turn the globe so that the country you live should face away from you while brewing. You don’t have a globe in your kitchen? Great tips – thanks very much. I use the cup-to-cup method, buy my first vessel is a gravy separator – the grounds stay in the bottom because of the position of the spout. Grandma used to put a fist (or two) in a pot till it begins to boil. Let it settle then pour. I dropped my coffee carafe this morning and it shattered. I wasn’t even fully dressed yet. So I loaded up the coffee in the filter part and I had a different carafe that did not fit my coffee pot so I just held the plastic filter portion over the other carafe and poured boiling water boiling water through it. It did the trick.